Whether in town for a meeting or a conference, Oriental Residence Bangkok offers a hassle-free retreat where intuitive staff ensure post-work decision making is made easy. Time is precious and with fast-track immigration at Suvarnabhumi International Airport and a chauffeur-driven Jaguar limousine transfer, business travellers will arrive feeling refreshed and ready to attend a meeting or crack a business deal. No need to wait for inconvenient check-in or check-out times; guests can check-in at any time that suits their schedule and then simply check-out 24 hours later. Comfortable and spacious accommodation features all the benefits of home and more, including complimentary wireless internet access, fully-equipped kitchen facilities, DVD library, technology kit to ensure all your gadgets are connected and Penhaligons amenities. 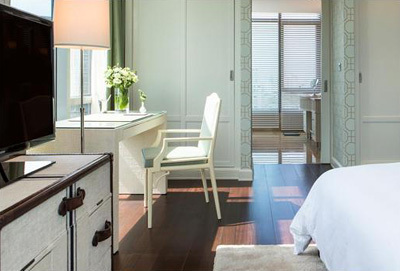 Offered until December 31, 2012, the Business Traveller’s package includes two nights’ accommodation in an Executive Deluxe apartment, with a guaranteed upgrade to an elegant One-Bedroom Suite, plus 5% discount offered on all additional nights. Additionally this package includes a seamless one-way airport transfer in a luxurious Jaguar XJL, delicious gourmet daily breakfast at Cafe Claire, and complimentary pressing service for up to three items per stay. Available from 13,545 THB (approximately £270). Oriental Residence Bangkok is offering an exciting selection of special promotions featured on oriental-residence.com. For more information and reservations email reservations[at]oriental-residence.com.